The guttering on the property has not been cleaned for about 15 years. I contacted Lgb Vision for a quote which was very reasonable. The work was carried out to a very high standard and my guttering looks amazing just like new. I can thoroughly recommend them, will definitely be using them again. We found Lgb Vision by accident. They knocked on the wrong door when trying to find an address. After i watched how they cleaned next door I asked for a quotation. Very reasonably priced and excellent service. I rang up Damien because my landlord required our windows cleaning ASAP. Damien went above and beyond to fit me in that day and help me. He did a brilliant job that really helped me out in my time of need. He is a lovely guy and I fully recommend him to anyone. First clean was amazing and every clean since then has been perfect. I moved to Great Denham and had trouble finding a reliable window cleaner. So glad i found Lgb Vision cleaning in Great Denham. Following my email to Lgb regarding the discovery of wasp nest activity under our roof they couldn't have been more helpful and efficient. 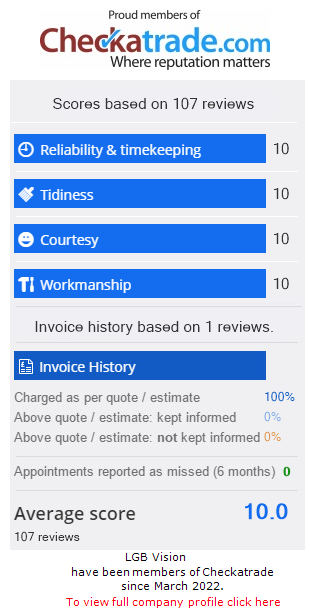 A speedy response to fix a time and date, information on possible cost, and contact details. Lgb arrived as agreed and they were brilliant at explaining exactly what they was going to do, and the effect it has on the wasps. They also left direct contact details in case of any follow up needed for determined wasps. The treatment worked well and we are currently still wasp free! Thanks Lgb. Great Service.